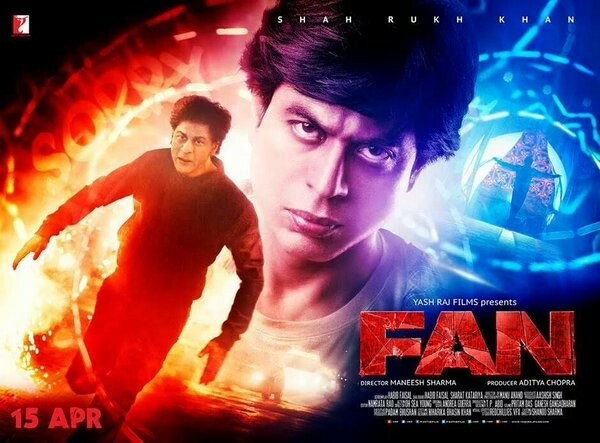 Home Reviews Movie Review Did SRK win this fan back in “FAN”? I not not narrating story here, I’m just sharing what I think about movie. Movie starts at a good pace and finishes establishing the theme in first 10 mins. Then the fan GAURAV goes Mumbai to meet his star ARYAN KHANNA for his birthday like thousand other fans. His love for his star is not like fan-star love it is more of an obsession. He can do anything for his star as he claims even a murder. He becomes violent with another star who tries to malign Aryan khanna. Story takes a turn when star was not happy with his fan’s violent ways and despises him. INTERVAL. Till now(1 hr) the movie was at great pace and I was in awe with SRK’s acting again. After interval movie has the plot where Fan takes revenge from star because he rejected him. Fan impersonate Star at has different events and do things which would malign his stardom. Post interval movie has some impossible looking scenes and scenarios but still since the theme was gripping we can ignore it for sometime. But in last 15 mins I felt they stretched the imagination too far away from reality and I was feeling like movie should have ended there. The message movie tries to convey is in the last scene and it is great. The movie has glimpses of SRK’s home and interior as well. The film has the SRK charm again and you see glimpse of SRK from “Darr” in Gaurav’s character. Overall I loved the movie and my love for SRK’s acting is back. I loved that they made it short (2 hrs for bollywood is short :D) and sans songs but I felt it could have been shorter by 15 mins. I too was a shahrukh fan in my teen days but Now he is really doing idiotic movies these days and I am not interested in his movies anymore. Fan had a good start but it really lost grip later. I hope he chooses movies wisely.